If you are interested in trying a new type of eggplant in your garden this year, consider Mangan eggplant (Solanum melongena ‘Mangan’). What is a Mangan eggplant? It’s an early Japanese eggplant variety with small, tender egg-shaped fruits. For more Mangan eggplant information, read on. We’ll also give you tips on how to grow a Mangan eggplant. What is a Mangan Eggplant? If you have never heard of Mangan eggplant, it’s no surprise. The Mangan cultivar was new in 2018, when it was introduced into commerce for the very first time. What is a Mangan eggplant? It’s a Japanese-type eggplant bearing shiny, dark purple fruit. Fruits are about 4 to 5 inches (10-12 cm.) long and 1 to 2 inches (2.5-5 cm.) in diameter. The shape is something like an egg, although some fruit are larger on one end for more of a tear-drop shaped. Those growing Mangan eggplants report that this plant produces a lot of fruit. The eggplants are relatively small but delicious for roasting. They are also said to be perfect for pickling. Each weighs about one pound. Don’t eat the leaves though. They are poisonous. According to Mangan eggplant information, these plants grow to 18 to 24 inches (46-60 cm.) tall. They require at least 18 to 24 inches (46-60 cm.) of space between plants to give each room to grow to mature size. 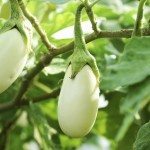 Mangan eggplants prefer well-drained soil that is very acidic, slightly acidic or neutral in pH. You will need to provide adequate water and occasional food. 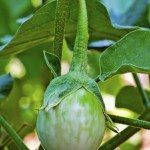 If you are wondering how to grow a Mangan eggplant, it’s best if you sow the seeds indoors. They can be transplanted outside in springtime after the last frost. If you use this planting schedule, you will be able to harvest the ripe fruit in mid-July. Alternatively, start the plants outside in the middle of May. They will be ready to harvest in the beginning of August. According to Mangan eggplant information, the minimum cold hardiness of these plants is 40 degrees F. (4 degrees C.) to 50 degrees F. (10 degrees C.) That’s why it is important not to sow them outdoors too early.